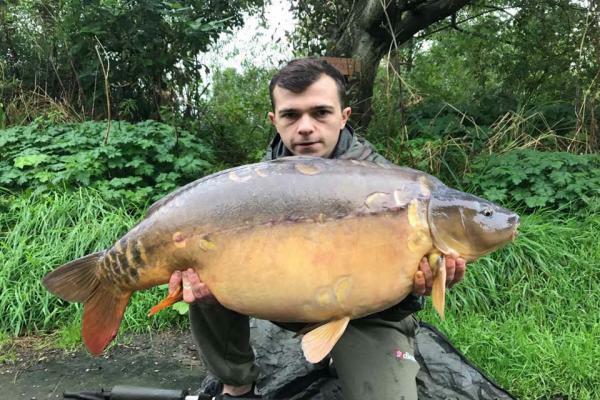 Its been a while since I wrote a report but what a great end to the summer three 40lb carp at Furzebray Lakes, Tony got Married had a marque on the lawns such a great day and the sun shone even ended up with 12 great chunks trying to be carp in the lake at midnight. It has been a good summer on the lakes overall after we had some problems with weed which seams to be a problem this year on a lot of fisheries, but after a lot of hard work raking it out we got on top of it and the lakes are now clear. The carp on all three lakes had a very good spawning with fish like Charlotte, Black spot and Clover dropping up to 5lb in weight. Willow lake is now getting popular as the carp are gaining weight, since we reduced the numbers last winter, and the Copse fish are growing well. As there are a few smaller carp now appearing in Island lake and we are moving them out into the stock ponds, so anybody who catches one below 10lb hold onto it and contact us so that we can move it out. Also any carp under 10lb in Willow we are moving out. Just put them in the weigh sling contact us and hold on to them. untill you leave. I know the Swans can be a nuisance at times but we and the visitors love to see them on the lake with their signets so please be careful. Over the last two week since the low pressure and full moon the fishing has gone mad all the big carp are being caught with two more 40lb carp to add to our stock. Drop scale came out first at 40lb 6oz and then 24hours later out came Clover at 41lb 6oz. So now we have three 40 lb fish come on Charlotte how big are you now 45/46 ? We are full up on Island Lake until November so think ahead if you want a swim on the Island but if you cant get on Island have a go on Copse or Willow its better than staying home there are some great carp to catch. The gardens have looked wonderful this summer so do take the opportunity to have a walk around.